The Mermaid's Tale: Evolutionary genomics and interior decorating. Part II. Why is there genetic variation in anciently adaptive traits? Evolutionary genomics and interior decorating. Part II. Why is there genetic variation in anciently adaptive traits? Yesterday, we discussed a human-interest NYTimes story on the widespread sharing of human traits by other animals. The details of the piece were interesting but in a sense, none of what was discussed was new or surprising in principle, if one thinks in evolutionary terms. If some trait of ours, or something we do, is also found in other animals, especially distantly related species such as between us and fish, observers tend to automatically characterize it as 'adaptive'. In the NYT piece an example was dopamine release as a reward for evolutionarily advantageous behaviors. We may not really know what any such trait evolved 'for' in fish, leopards....or humans. But regardless of the almost-always speculative nature of the specific scenarios suggested, the idea is that the trait must at least not have been very harmful, if not beneficial (the usual interpretation) and must in some way be due to the action of genes. 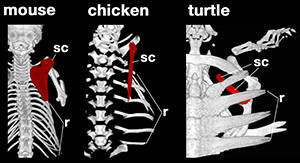 Ribs (sc=scapula); Photo © Kuratani and Nagashima / Science AAAS. Fish have ribs, frogs, snakes, birds and mammals have ribs. These are produced during embryogenesis by the action of various genes, some of them known, that are similar from fish to humans. They may not be as similar as was once thought (by Ernst Haeckel in his famous argument that 'ontogeny [development] recapitulates phylogeny [evolution]'), but the essential mechanisms are conserved--fixed among diverse species (except perhaps for harmful mutations that always arise and are quickly removed by purifying natural selection). Every member of these species has the genes whose action produces ribs. The same will be true of disease--because related species share so much genetically and metabolically, they also share ways in which these systems can go wrong, whether due to genetic or environmental causes, or a combination. So it is wholly expected that other species will get cancer or diabetes, and so on. And the same will apply to any shared traits, including behavior. The article we discussed in Part I yesterday gave a number of fascinating examples. However, despite the irresistible temptation to make up Just-So stories such as how mood-altering substances may have been good for the ancient animals, and favored by natural selection, that need not be true. There can be incidental effects. Humans do interior decorating, an example in the NYT piece of how we get our kicks, but what we like comes and goes and varies among cultures. However our brains work, we have genes enabling esthetic taste; but those genes need not have been 'for' esthetics. We do math, but some use Roman numerals or an abacus, and others do calculus on paper or computers. We have these abilities even though our ancestors, even just among humans, much less red snappers or dung beetles, did not do interior decorating or calculus. Whether the same genes underlie quantitative analysis in ants, or bower birds' nest-shape esthetics is something we'll leave to the experts. That's because it's irrelevant to our point here, which is that a trait once here for one reason can be used for other things. We used to throw spears for survival, now we swing bats for runs in baseball and cricket. The usual casual, default, text or pop-sci view is that a trait with adaptive fitness value should come to be fixed in a species, as ribs and other things generally are. They shouldn't show much variation because selection has favored the trait, getting rid of genes that didn't confer it! This might seem especially so if the trait has been essentially fixed for tens or hundreds of millions of years. So what about the traits we're discussing here? If we share them with mammals or even fish, how can they still vary? Weren't they fixed long ago? The reason to ask this is that most traits, normal, disease, behavior or physical, vary at least to some extent in any population. This can be due to the chance aspects of cell interactions during development, or to environmental effects, and so on. But, remarkably, most traits show evidence for genetic variation. Relatives resemble each other. In those cases where you can do an artificial selection experiment, the population responds: the trait values in offspring shift towards the direction you favored compared to the trait values in the parents. Familial clustering is, after all, one of the rationales for universal GWASing of any trait one has enough intelligence to spell in a grant application. Often the degree of clustering or the evidence that it's genetic and not environmental or cultural is very weak, but never mind. Money is money and it keeps epidemiologists and geneticists out of soup kitchens. In any case, there are several possible explanations for the resemblance among relatives. And they're very instructive. One could say that behavior (like taste in draperies or interior wall colors) is something our brains make without any particular genetic basis for it. Familial resemblance could be due to shared experience: you grow up in a house with wallpaper, you may like to have wallpaper; no genetic variation has to be involved. We are in such haste to assume genetic variation is responsible that, without nearly adequate evidence, we make up evolutionary stories (as in those about other animals' behavior resembling ours), and far too many people swallow the stories uncritically. We usually do that because we have Mendel's peas in mind. They were either green or yellow, but that's because he crossed two strains, one all green and the other all yellow. There were only two states under study. If Mendel had then selected for, say, green, he'd have quickly eliminated the 'yellow' variant from his hybrids. By extension to evolution, it's natural to think that if a trait were of adaptive importance, and selection arguments are valid (regardless of the specific selective reasons) then new variation that made you like paisley wallpaper (or, rather, made cheetah's like paisley wallpaper), rather than not like paisley wallpaper, would have advanced in frequency and been fixed in the species. If wallpaper colors were like pea colors, the variation we see today in wallpaper preference simply couldn't be due to genetic variation--interior decorators have jobs because what we like on our walls isn't genetically determined. But this brings us back to the problem, because basically every trait seems to be genetic, and yet it also varies at least slightly, in any species! And in a sense the subtle influence of Mendel is the problem. If, rather than being like Mendel's peas, whose color variation was due to a single variant in a single gene, a trait is affected by many genes we can easily understand how it can at once have been selected 'for' long ago, persisted because of its importance, and still vary today in any species we'd like to study. Each of the contributing genes, being a gene, is subject to mutational variation. So are the DNA sequences that regulate the use of each of the genes. Mutations with awful effects will quickly fail and disappear from the population. But most mutations have little (if any) effect on the trait, and thus on the adaptive fitness of the trait--that is, on the bearer's chances of reproduction. Their fate is largely determined by chance. Genotype combinations of variants at these many genes will be removed from the population, but the same variants can stay around because most of the time they'll be in combinations that are not harmful or helpful. The trait is maintained by natural selection, but individual genetic variants can change over time. Most individual genetic variants have only trivial effects on the trait. Each generation, there is new genetic variation introduced in these genetic regions, and some existing variants pass out of existence. This is all wholly consistent with what we know about evolution, and is also wholly consistent with what we find in GWAS. And we'd find it if we did GWAS for interior design preferences, too! But there is an important implication, if you think carefully about it. What it means is quite important: the long evolutionary conservation of traits does not mean they are fixed, as would be the case if they were due solely to a single gene or if most variants were important. What it does mean is that traits are complex, just as we're finding them to be with genome mapping studies (GWAS and other types of study). To the extent that this reasoning is correct, it is an indirect but perhaps quite informative bit of evidence about genetic control: Variation and persistence suggests or even implies complexity. In evolutionary terms the more conserved they are among distantly related species, the more likely they are to involve many different genes, because that is basically how they can still vary today in complex ways. They are not Mendelian by and large, even if a few, usually very rare, variants exist any time that have major effects (such as is the case with most diseases we study). Thus, the fact that wildebeests, monarch butterflies, and even humans share a sense of esthetics shows that the trait has likely been maintained, for whatever reasons, by some sort of selection so that there is not major variation within the population. Whether they and their relatives prefer paisley or pastel wallpaper is likely not to be 'genetic', or to be very important biologically. Our traits are due to many interacting factors. In a way, such redundancy and complexity protects species from being too vulnerable to harmful mutations (or unexpected environments). If, thinking Mendelishly, we expect otherwise, or hope for simplicity, we are deluding ourselves. We may talk 'evolution' but are not thinking clearly enough about it.